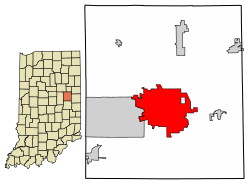 Location of Muncie in Delaware County, Indiana. ↑ Huppke, Rex (April 27, 2003). "Day of prayer turning into day of discord". Chicago Tribune. Chicago. अभिगमन तिथि November 7, 2016. ↑ Roysdon, Keith; Walker, Douglas (2016). Wicked Muncie. The History Press. आई॰ऍस॰बी॰ऍन॰ 978-1-43965-665-5. ↑ Lasley, Norma (2012). "Muncie". Delaware County. Arcadia Publishing. पृ॰ 57. आई॰ऍस॰बी॰ऍन॰ 978-0-7385-9430-9. ↑ Younge, Gary (November 11, 2016). 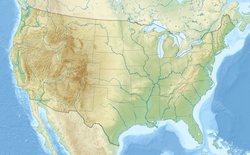 "How Trump took middle America". The Guardian. London. अभिगमन तिथि November 16, 2016.